At Smile Charlotte, we are blessed to have a family of patients who trust us and value the dedication, personalized care, and attentiveness that we’ve given to people in the community over 34 years. Did you know that most of our new patients come from referrals by people like yourself? Chances are, you were one of them. If you have friends and relatives who could benefit from our services, sen them to see us at SmileCharlotte. 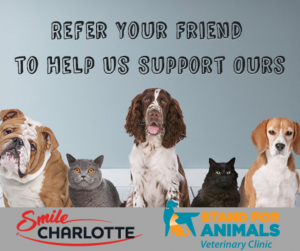 And as our way of saying thanks for your referral, we will make a donation* to Stand For Animals Veterinary Clinic, who is helping support our canine and feline friends. Happy national pet day! *Limited to April 11- May 15, 2019.